With thorough industrial knowledge, we are manufacturing and supplying a gamut of Pulses Packing Machine. These products are manufactured employing latest machines and tools in accordance with the international quality standards and guidelines. Widely used for packing different products with single spout for weighing and filling in standard open mouth bags. These machines we offer are widely applauded in the market for their rugged construction, optimum performance and simple operations. The machine shall be approved and stamped by Department of Legal Metrology before dispatch. 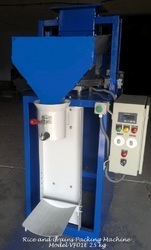 Koyka Automatic Packing Machine with single spout for weighing and filling in standard open mouth bags.